Samira’s story began on Oct 8th, 2017 when Gulf World Marine Institute assisted Emerald Coast Wildlife Refuge in the rescue of the stranded bottlenose dolphin following Hurricane Nate. The animal was found washed up on the beach on Okaloosa Island by two beach goers that reported the beached dolphin to Florida Fish and Wildlife Conservation Commission. While the exact cause of stranding is unknown, the young dolphin could have been separated from its mother prior to her stranding. Samira was malnourished and lethargic at that time. 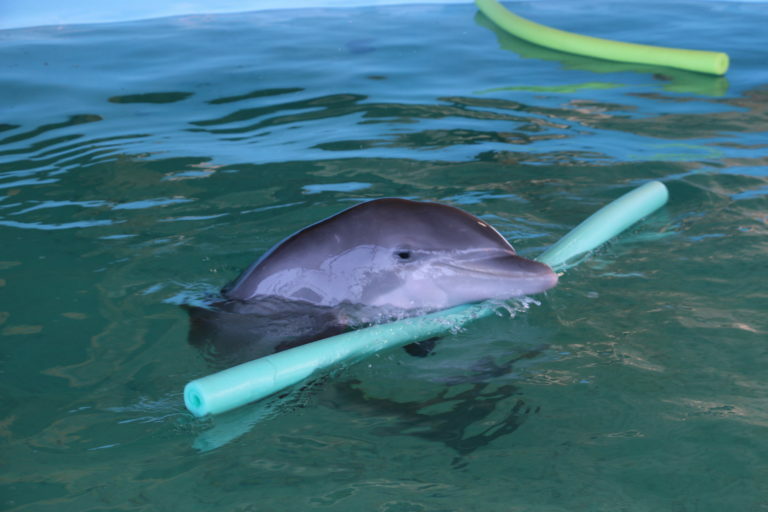 After 10 weeks of rehabilitation at Gulf World, Samira was been deemed non-releasable due to her very young age and mother dependency by National Marine Fisheries Service (NOAA). NOAA chose Gulf World as her permanent home. Samira is thriving with the dolphin family at Gulf World Marine Park.